In a glass jar shake together all ingredients. Put 1 or 2 flank steaks in a large zip lock bag and pour marinade into bag. Seal and marinate in fridge 6-12 hours. 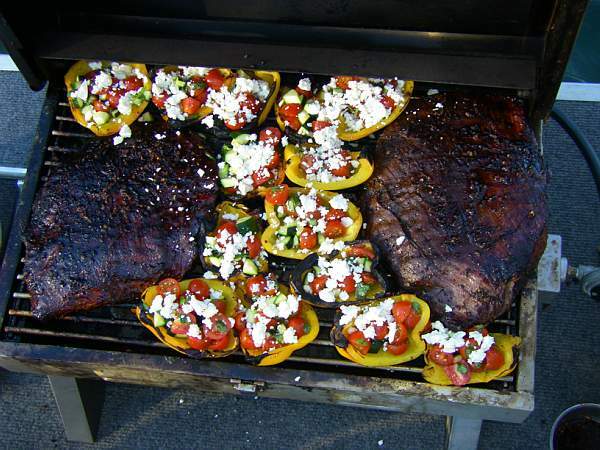 BBQ until done to your likeness. Some like it rare and others like it well done. Bast as it BBQ's with the marinade. Tonight I will serve this with . . It's Canada Day tomorrow and we are celebrating tonight with family. What a privilege we have to live in this great country. God has blessed us with much. Lets not forget to thank Him tomorrow. I'm sure that this is a staple recipe in most Mennonite households. . . .so it needs to be included here as well. I was merrily putting this together yesterday. I was half way finished when I suddenly remembered that I originally got the recipe from Anneliese. I emailed her and told her that I was making her recipe, I would take the picture and send it to her and she could post it. She graciously told me to go ahead and post it myself. Beat the eggs and sugar together really well in a large bowl. Beat them until they are thick. Stir this into the beaten eggs and sugar. Heat the milk and butter till very hot, not quite boiling. Add the hot milk/butter to the batter. Pour into a large shallow greased and parchment papered pan. Bake at 350 F for 15 - 20 min. In a medium saucepan, heat together the butter and brown sugar and the whipping cream until it just comes to a boil. 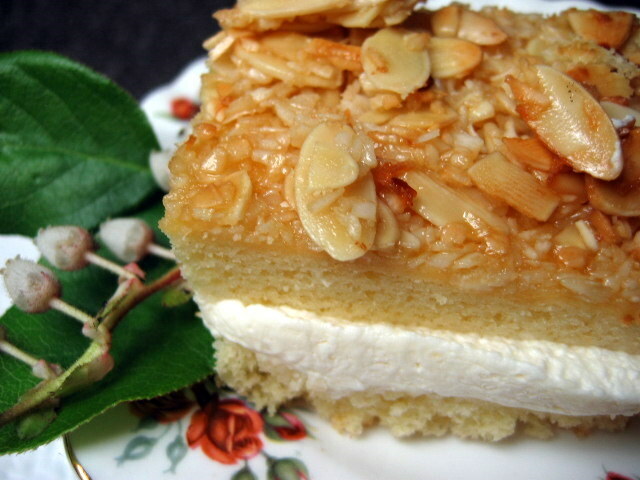 Add the toasted coconut and the almonds. Spread onto the baked cake as even as you can. Broil carefully for a few minutes until it is nicely browned. Do not walk away from your kitchen. Take the cake out of the pan with the paper on. Set it on the counter and with a long serrated knife slice it in half. Very carefully slide your hand under the top layer and slide it off as best you can. Put the whipped cream on the bottom layer and then slide the top layer back on top. Set it in the refrigerator until you are ready to serve. This actually freezes really well and cuts very easy when partially frozen. I did this to take the picture. I'm so excited to share about the wonderful day I had with my Mom yesterday. 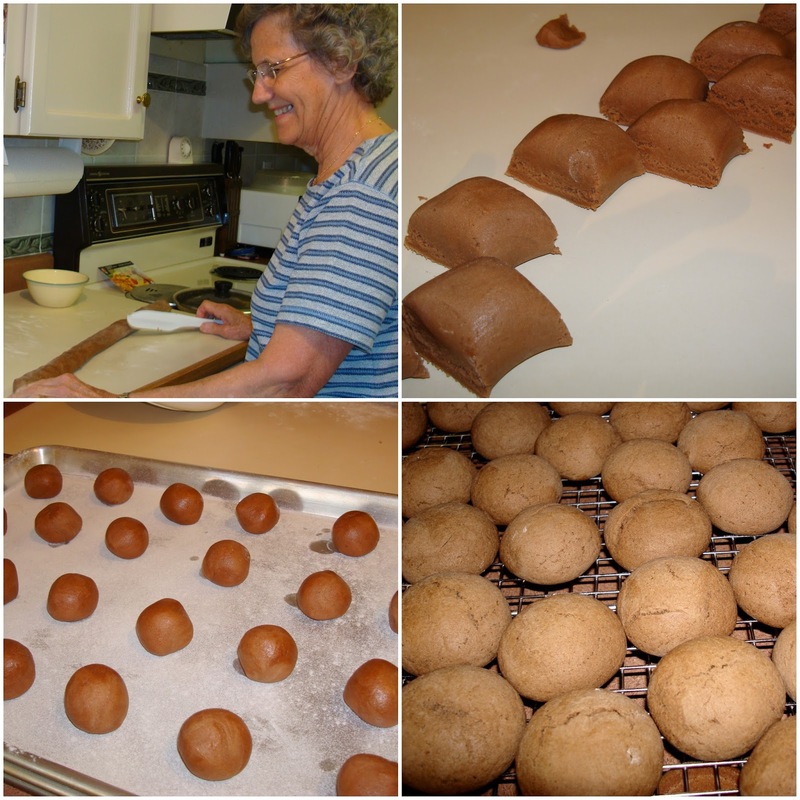 My family has been telling me for a long time that I NEED to learn how to make Oma's chocolate cookies and Perishky! I bake pretty well anything else, but I've played ignorance with some of her specialties because I just want to enjoy them when she makes them. It was so cute how she was almost giddy about me taking pictures of her while she was doing what she knows how to do best! I'll post the cookies first. The Perishky are coming later . . . Oh, and these cookies are the best cookies to take camping because they keep so well. Feel free to ask questions because I may have missed something. In a stand mixer, mix butter and sugar, beat in yolks and then honey. 4. Divide dough into quarters. Roll each quarter into a 20 - 24 inch roll (snake) and slice into aprox 1 inch pieces to roll into balls. 5. Place on prepared cookie sheets and bake at 375° F about 12 -13 minutes. 6. Remove to wire rack to cool. Frost with sugar glaze. Sugar Glaze - This is a bit tricky but a fun challenge. With experience you learn exactly what to look for as you cook the syrup. Be prepared to focus on glazing the cookies as soon as the glaze is ready. You can't let it sit. Have wax paper lined cookie sheets ready. If you want to test this procedure, you can do half the recipe and cook twice. Use a small pot if doing half the recipe. In a medium glass bowl, beat egg whites until almost stiff and set aside. Immediately pour syrup into beaten egg whites, with beater on, and continue beating for a few minutes, until thick and wavy. Place on waxed paper lined cookie sheets, not touching each other, until glaze dries. Slightly undercooked glaze may take up to 24 hours to dry. Leave cookies uncovered until they are no longer tacky. Store cookies in ice cream bucket in a cool place or freeze. This recipe yields 7 - 8 dozen. Gauge baking time by their size. If you have less than 80 cookies, they will be larger and need an extra minute or two to bake. You want them to taste moist and cake-like, but if they "cave" once cooled, they are under baked. Some ways you may be able to salvage glaze that has not turned out perfect: If it is too thin (runs off the cookies, beat it for a few more minutes, adding a tablespoon of cornstarch. If, while you are icing the cookies, it dries too quickly and becomes grainy, beat in a tablespoon or two of water. If nothing works, just start again. =) ... but remember that even cookies that don't look perfect, still taste amazing. 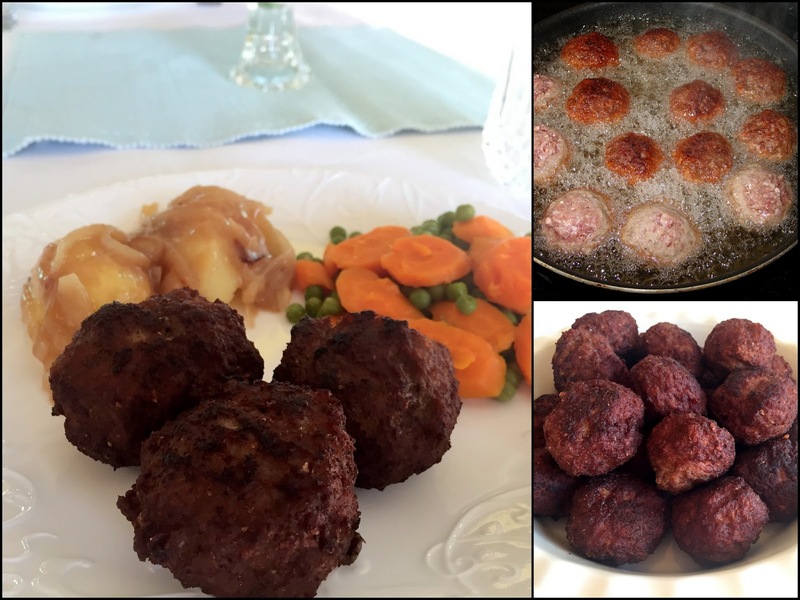 I can't give you the history of these tasty little deep-fried meatballs, but I know they were a regular menu item in the home in which I grew up. They are wonderful served hot or cold...a summer picnic favorite at our place. Soak bread in water, and wring out excess. Add the 'soaked bread' to a blender along with all other ingredients except for ground beef, and blend until smooth. In a large mixing bowl, combine pureed mixture and ground beef. Form meat balls of desired size. Heat about 1/2 inch oil in frying pan and cook over medium-high heat. 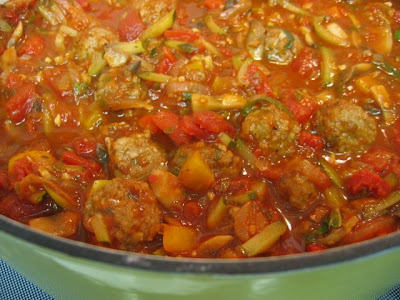 Turn meat balls over once well browned on the bottom side; cook several minutes longer. Tip: If not using a blender, grate potato and onion before adding to meat mixture. 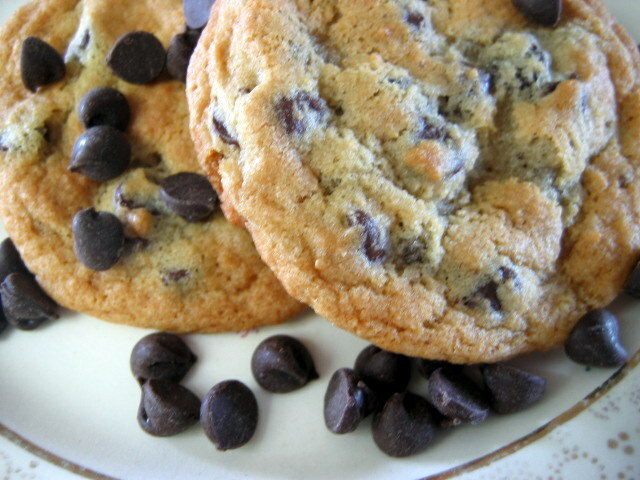 Every Cookbook should have a Chocolate Chip Cookie Recipe. I was whipping these up this afternoon for our coffee break and took a few pictures. I found this recipe in a church cookbook and it was contributed by Vange. Our family has been hooked on these cookies since 1992. We love them. . . so simple always soft and chewy. The different addition is the syrup. Cream the butter, add the sugars and then the egg, vanilla and then the dry ingredients. Use an ice cream scoop that has a scraper in it to make balls of dough. No need to flatten, the butter helps with that. Bake about 7-9 minutes depending on the size of the cookie. Rhubarb Pie has been a favorite for our family for years. 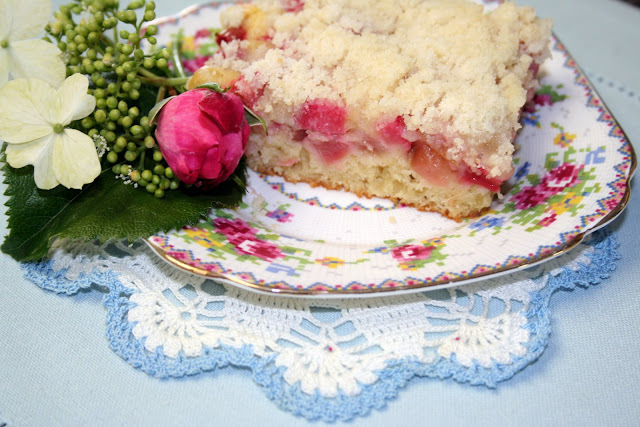 I got this recipe from my next door neighbor and have enjoyed making this recipe every spring when rhubarb harvest is plenty. This is my favorite pie crust recipe. This pie crust recipe is best used in the large cookie sheets. I also use this dough to make pie by the yard, substituting apples, which is truly a specialty at our house. Measure the flour and salt into large bowl. Cut in shortening with pastry blender. Separate egg. Beat egg white until stiff. Stir combined egg yolk, vinegar and water into flour/shortening mixture along with beaten egg white. It may seem too moist, but do not add too much flour. Use flour sparingly and only if it is too sticky. Divide into halves and roll out the first half to the measurement of your cookie sheet. Fill with your choice of fresh fruit filling. Roll out second half of pastry to top the fruit layer. Pinch edges. Sprinkle top crust with 1 tablespoon sugar. Bake at 425' for 20-30 min. Check out the Rhubarb Recipe, using this dough crust. First treat yourself. Go out and buy the Pamper chef pastry board. I have made pies for many years, I don't know why I didn't buy this sooner. This is ideal for a large crowd. Add a scoop of ice-cream and they'll come back for more. Big Families, Big Pies & Big Ice-Cream Buckets. This is one of my mother's many specialties. You see I didn't grow up with chocolate chip cookies. I thought only Mr. Christie baked those ... grin .... and that they came from a bag. 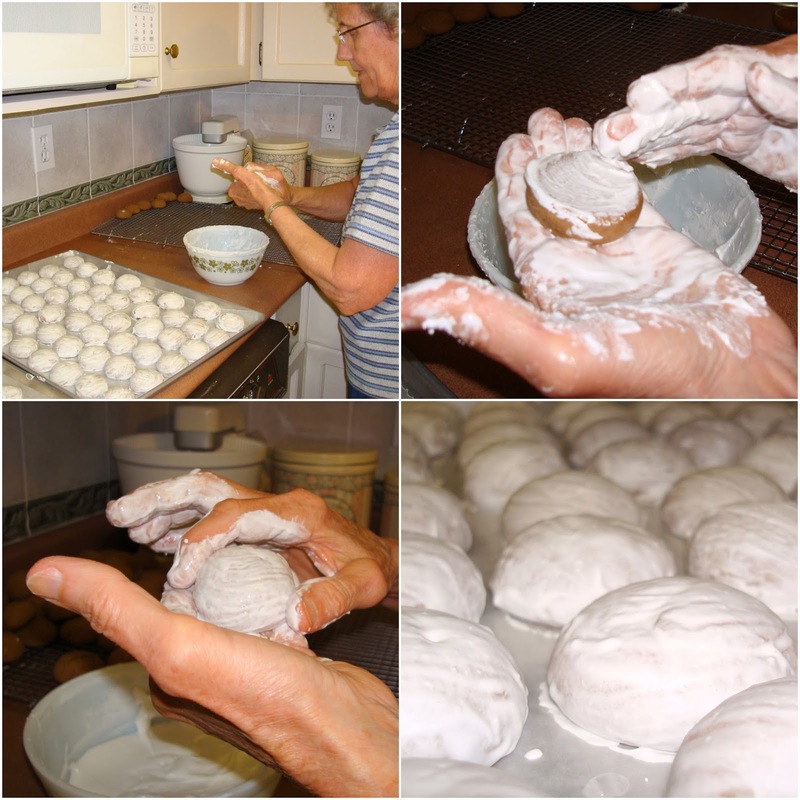 I grew up with German/Mennonite type of baking. I am first generation Canadian so I grew up with lots of European traditions. In grade 2, we had a spring tea at school. We were supposed to ask our mothers to bring "DAINTIES" to serve. So I brought home the sheet and my mom said, "What are DAINTIES, I don't know how to bake DAINTIES". I was a terribly shy kid and didn't know how to tell my teacher that my mom couldn't bake DAINTIES. I just bawled when the teacher asked me...........sniffling, shaking, blowing, I responded "My mama doesn't know how to make dainties"....... sniffle, sniffle. The teacher very gently rubbed my shoulders, said that it was OK if my mom didn't bake. I told her she baked lots, like cookies, Platz, tortes etc. etc. She replied, "Honey those are DAINTIES". Oh I was soooo relieved I ran home with new vigor and told my mom what DAINTIES were. Now you know the rest of the story. 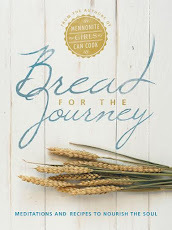 I hope that you will sample lots of her baking through these recipes. This is a large recipe that can be easily halved. Cream sugar and butter. Add eggs, beat well. Add vanilla and syrup. Measure flour with soda and salt. Add flour in several portions, mixing well after each addition. 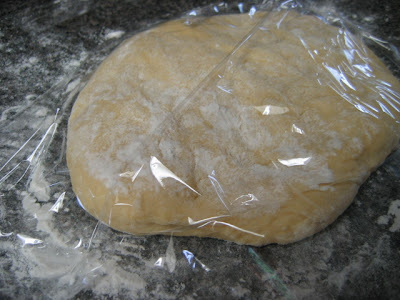 Chill dough several hours or overnight. Roll dough one small piece at a time on floured surface. Cut cookies with round cookie cutter and place on lightly greased cookie sheet. Bake at 350° F for 8-10 minutes. Let cool and put together with "DAMSON PLUM JAM", while still warm. This is according to my mother, no real recipe. Take your case of plums, wash them and put them in a big roaster. Bake at 350° F with the pits because the pits bring out better flavor. Then when they are soft, and split open and cooked good enough, (what ever that means mom) take out the pits. So, now you measure two parts fruit and one part sugar and put it in a large pot. Cook until thick enough (again who knows how long), you'll know. Skim off the foam or scum as it cooks, save that for fresh buns. Waste not, want not. When the jam is done, put in hot sterilized jars and cover with melted paraffin wax. as hungry as can be. and sweet milk in a cup. a puppy or a bug. if no-one's home to greet them with a cookie and a kiss. (taken from a farming community cookbook). I started a tradition that wasn't really meant to be a tradition, but when you are Mennonite and do something once that went over well and everyone liked it HAS to become tradition......."awe come on mom, we did it last year". So hence a new tradition had begun. Each child is allowed to invite their friends, cousins, second, third cousins, whom ever they wish. 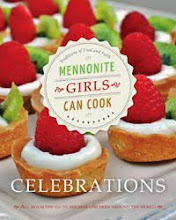 The first year that we did it my sister in-love and I didn't know how many the recipe would make so to be on the safe side the Mennonite in us came out and quadrupled the recipe. After all we wanted to make sure there was plenty. CAUTION..........unless you want to feed the masses of 500 or more DO NOT, I repeat DO NOT quadruple the recipe. We made hundreds, fried for hours, we were covered in a thin layer of grease ourselves. We invited another family, then more families, then people from church, neighbours. They ALL got eaten. Donuts need to be eaten fresh. Set an afternoon to the side, set up a Coleman stove out side so your house doesn't smell like a deep fryer, invite the people you love and just enjoy. I must say that fun was had by all. Oh by the way I only doubled the recipe this time, I am sure the teenagers ate a dozen each. The boys for sure did. It made about 200. Add dry yeast to 3 cups flour, salt and sugar. Scald milk, add 1 cup water, oil and beaten eggs. Mix in enough flour to make a soft dough. Knead for about 5 minutes. Let rise approximately 1/2 hour. Roll into 1/4-1/2" thick and cut into desired shape with either a donut cutter or cookie cutter. Careful that the oil doesn't get too hot, usually cooking on medium heat to medium high is enough. Glaze while warm in following glaze. Whisk ingredients together, keep on a low element. Dip the warm doughnuts into the glaze and place on parchment lined cookie sheets to dry. This is one of my stand by recipes for when I get a call that we are having unexpected guests for a quick lunch on their way through town. I always have these simple ingredients in the house, and since there is no rising time involved, it is an easy yet delicious lunch. Fry together until browned, and drain any fat. Stir in one can Cream of Mushroom soup. Let simmer about 5 minute. cool mixture completely. Mix the above ingredients together. Then cut in 1/4 cup butter with a pastry blender. Then stir in 1 cup milk. Stir until dough begins to form a ball. Lightly flour counter and gently knead dough into a smooth ball. Flour counter a bit more and roll dough into a rectangle not quite 1/2 inch thick. Spread cooled meat mixture onto the dough and roll as a jelly roll. Slice 1" thick sliced and place (almost touching) onto lightly greased small cookie sheet. Bake at 425for 15-20 minutes. 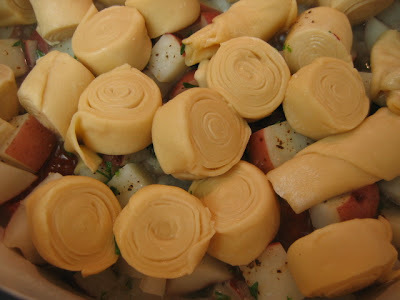 Meat will bubble a bit and biscuit should be golden brown.Let rest in pan while you make a thick pourable cheese sauce. Stir in 2 tbsp flour stirring until smooth. Serve cheese sauce on the side in a gravy boat or small pourable jug. Although we usually use this recipe for Christmas cookies, I’ve found that this is a fun recipe to celebrate many other occasions as well. Over the years I’ve collected a number of cookie cutters and enjoyed such things as taking apple cookies to the teachers, putting dinosaur cookies in little boys’ goodie bags or putting smiles on little girls’ faces with heart cookies. Mix butter, icing sugar and egg well in mixer. Add milk and vanilla, then combined dry ingredients. Divide dough into two parts for easier rolling. 5. Roll out on floured surface (sprinkling flour on top as well) to about ¼ inch (or slightly less) thickness. 6. Cut shapes with cookie cutters such as hearts, dinosaurs, Christmas trees, turkeys or whatever the occasion. 7. For easy decorating, sprinkle unbaked cookies with colored sugar. 8. Bake at 375° F for about 8 minutes or until edges just begin to look done. Do not over-bake. Mix 2-3 cups icing sugar with 2 tablespoons soft butter and enough milk to make a medium thick icing. Color with food color drops. 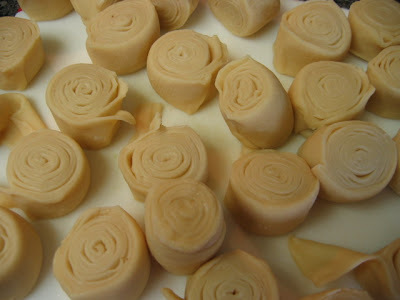 Use icing tube with plain tip, pressing gently to “outline” cookies. 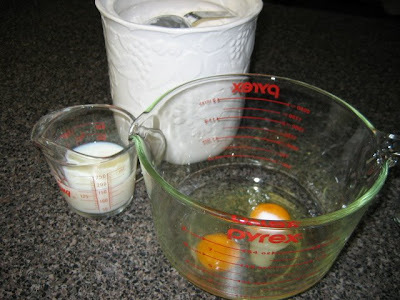 *put the egg and vinegar in a 1 cup measuring cup and fill to 1/2 cup. In a large bowl, cut the lard into the flour, salt and baking powder. Add the wet ingredients all at one time and stir. Turn the pastry onto the counter and shape it into a ball and combine it just until no flour is loose. Divide it in half, wrap it in plastic wrap and put 1/2 into the fridge for future use or make a double pie now. Roll the pie crust out to about 1/4 inch thick. Put it into your pie plate and leave a little room on the edges to turn the crust over and flute a bit. After the crust is in the pan, I take a double layer of foil and press it into the pan covering all the crust. I make sure that it is in all the edges. Bake for 10 minutes, turn heat down to 375 bake another 10 minutes, remove the foil and bake until golden brown, about another 10 minutes. Combine sugar and cornstarch in a 6 cup microwave safe measuring cup. Add water, egg yolks, salt, lemon zest and lemon juice. Cook in microwave and stir it every 2 minutes on high until it has come to a bubbly boil. Begin to prepare meringue while filling is cooking. Add 3 tablespoons of soft butter. Beat your egg whites adding in the cream of tartar and sugar until the whites are glossy and thick. As soon as the filling is done, pour it into the cooled pie shell, and immediately after add the egg whites on top making little mounds until it is all covered and touching the crust. Bake at 350 F until it is golden brown (about 22 -25 minutes). If you put your meringue on your lemon filling when it is hot it will not weep. Persian Salad Dressing. This is my first contribution to the blog and I decided to start with an easy recipe that is from my Persian heritage. This recipe is from a book I own called In My Persian Kitchen. Both my Mom and Dad's families lived just outside Tehran from 1932-1947 after escaping out of Russia. My parents were married in Iran in 1943. There are a lot of Persian influences in my Mother's kitchen passed down to us. Whisk all ingredients together until incorporated well and slightly thickened. Pour over salad greens with cucumber, tomatoes and onions and toss well. If you've ever had the chance to enjoy Dorothy's Salsa and wished you had the recipe here it is. Thank you, Dorothy, for being so willing to share it with everyone.You can make it hotter by adding more jalapeno peppers and you can also add some hot sauce. Another variation is to add some canned black beans or corn . . or both. I'm giving you the half recipe which is just about perfect for a party. That's it. It takes a bit of time to chop it all up but then it keeps in the refrigerator for a week at least. If you can't use it all up, just freeze it in small bags and use it in recipes. On the weekend, we often grill quesadillas and served this salsa and some guacamole with it. A perfect summer evening casual dinner idea. 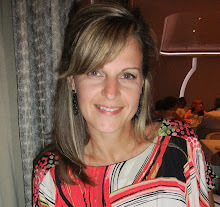 This is a recipe that I have posted on my What Matters Most blog. My friend Corinne had sent me the recipe and it works out beautifully in tiny muffin tins. 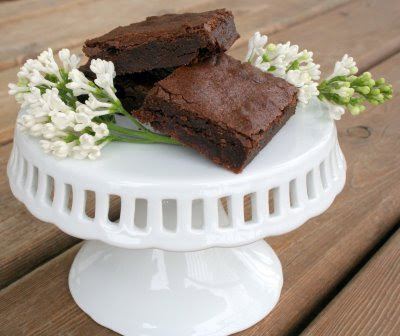 Brownie bites are perfect for picnics. Stir in all ingredients in order listed. Spread into a well greased pan 9 X 13. Bake at 350 degrees for 30 minutes. If using small muffin tins, watch carefully to see that they have puffed and then they are nearly done. 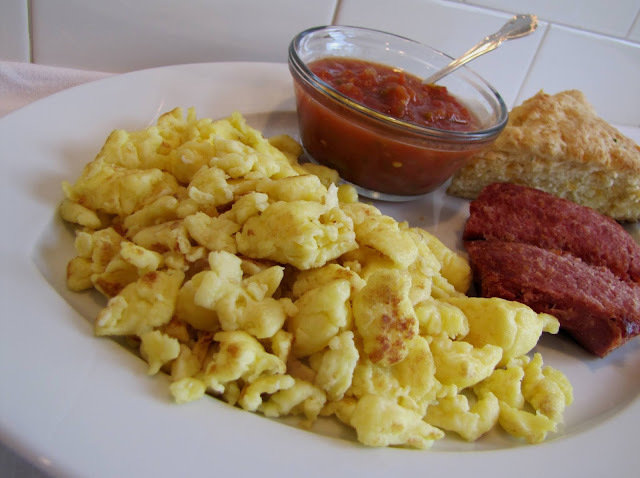 Mennonite Scrambled Eggs. Rührei is what we called them when I was a kid. This was never a breakfast meal at our place, but rather a quick lunch or supper. I'd all but forgotten about them until yesterday when I was looking through the fridge to see what I could fix in no time flat, and rührei came to mind. This is a creamy version of scrambled eggs...rather like a cross between an omelet and a pancake. It pairs well with ham or sausage...sprinkled with freshly ground pepper and served with salsa for a little zip. Mix flour and milk into a smooth paste. Add eggs and salt and mix well into a thin batter. Melt butter in frying pan over medium heat. Cut and stir with spatula until completely cooked through...and until golden brown if desired. This sticky, citrus yeast bun recipe was passed around in my mom's circle of friends in the 1970's or possibly 80's, when I became eager to make them for my family as well. I have included a collage of photos for anyone who is more of a visual learner. In bowl of stand mixer or large mixing bowl, beat sugar and eggs well, then beat in butter and sour cream. Add water and a few cups flour, then the yeast and salt. Continue adding four to make a soft dough that holds together. The amount varies with the humidity of the day. 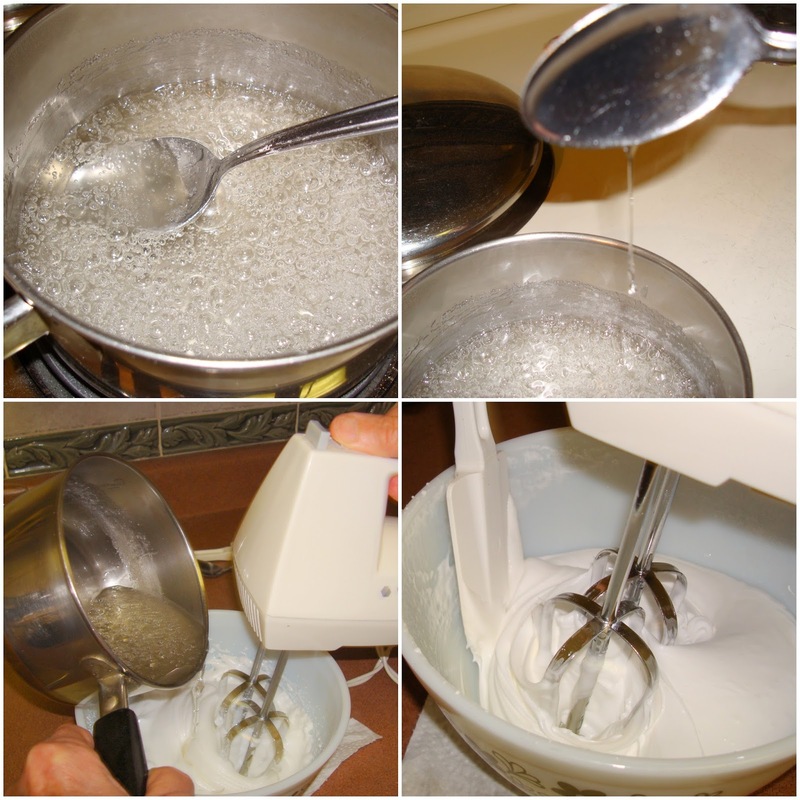 (If you are using a mixer, use a dough hook attachment. Transfer dough to a large bowl when the flour is well incorporated.) Knead dough to hold a soft shape that pulls away from the sides of the bowl. It’s okay if it’s still a little bit sticky. 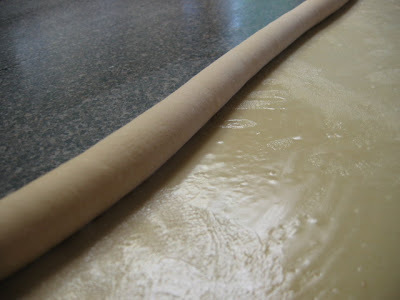 Pinch risen dough in half and roll each out (using a light dusting of flour under and on top) to about 10”x 20”. Do not press or work dough too hard. Brush with melted butter and sprinkle with 1/3 of the filling. (1/3 for each half and save 1/3 for topping). Roll up jelly roll style and slice into about 1 inch slices. Cover with tea towel and plastic. Let rise 1 hour. They can be touching when they are ready for pull apart buns. You can place them further apart for more individual buns. Sprinkle with some more of the coconut filling and bake at 350° F about 20 min. This past weekend we, like many others, headed down to the lake for a celebration and I was asked to bring the potato salad. This recipe is a "wanna-be" Oma Janzen's potato salad that she has never written down the exact measurements for. What makes this one different from other good potato salads is that it has no mustard, no sweet taste, but rather a little "sour-ish" flavor. If you like pickles, you'll probably like this salad. Now, to decide how many potatoes to cook, I usually count 1 small -medium potato per person. But if it's a potluck with many salads, then half a potato per person should be enough. Cook potatoes with a little salt until just done (approx 25 min). Easy to peel while still warm. (I like to keep some with the peel on for color) Boil eggs about 8 - 10 minutes. Allow potatoes and eggs to cool completely. 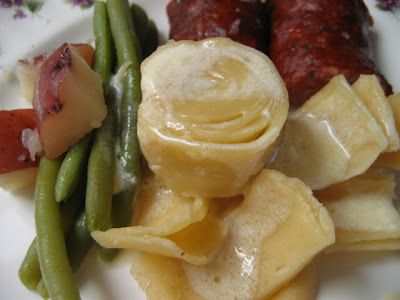 Cube potatoes and eggs (use egg slicer for eggs), and slice pickles. Mix dressing ingredients and pour on potatoes mix, stirring gently to mix. Mix the dressing according to taste. Add less or more vinegar and pickle juice, depending on how sour you like it. You can also make the salad more dry with less dressing or juicy with more dressing. Refrigerate before serving. Decorate with sprinkled paprika and parsley. I usually frost these cookies with white icing. But on occasion I add red food coloring for a pretty appearance. You can add just a drop for pale pink or more for a deeper color. This recipe is handed down from my Mom, she baked these cookies often. My mother in law also baked them for church bake sales and said they sold better if they had pink icing on them. So to test that theory I tried that at my next garage/bake sale. I had some with white icing and some with pink and she was right! The ones with pink icing sold first! Now I'm off to deliver cookies to my family! Cream shortening and sugar, add eggs, vanilla and mix until well combined. Mix flour, baking powder, baking soda, and salt and stir in alternately with the buttermilk into the creamed mixture until it forms a soft ball. It may still be a bit sticky but that's okay, cover bowl with plastic wrap and place in fridge for an hour or more. This way the dough is easier to handle and you don't need to use as much flour to roll out your dough. Roll out to thickness desired, approx 1/4". Cut with cookie cutter and place on parchment lined baking sheets. Bake at 375º for 9 min. Once cookies are cooled frost them with icing. Icing..mix icing sugar, softened butter, vanilla, red food coloring and milk till spreading consistency. What identifies this soup as coming from Oma's kitchen is the little bundle of fresh summer savory she added for the last hour of cooking and then removed before serving. Begin with cold water, peas, barley, salt, and spices. If you are using a ham hock or ham bone, add it at this time and omit the bouillon cubes, because you are getting the broth flavor from the ham. Bring to a boil (lid off), with a slotted spoon take off the scum that collects just before boiling point, then turn down heat to low and simmer (with lid open a crack) for about 1 hour. Take out ham, allow to it cool while you add the rest of the ingredients. Remove meat from bone and add to soup. 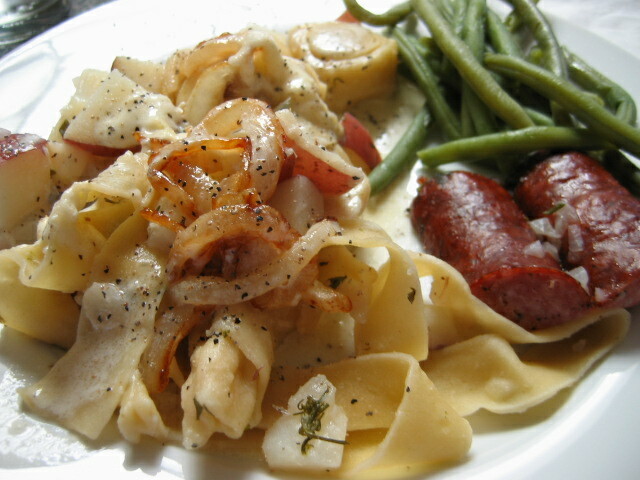 Add vegetables and cut up sausage (if you are not using ham), also either sprigs or dried flakes of summer savory. (You can get it in the summer at local fruit stands or from a Mennonite farmer. Dry it for future use.) 2 teaspoons thyme is an option if you don't have summer savory. Simmer for about another hour, until done. * Near the end of cooking, stir often, scraping bottom of pot to make sure the cooked peas don’t settle and burn. Repeat when you re-heat the soup. Add a little water if it gets too thick. Enjoy with Zwieback or Schnettchi. 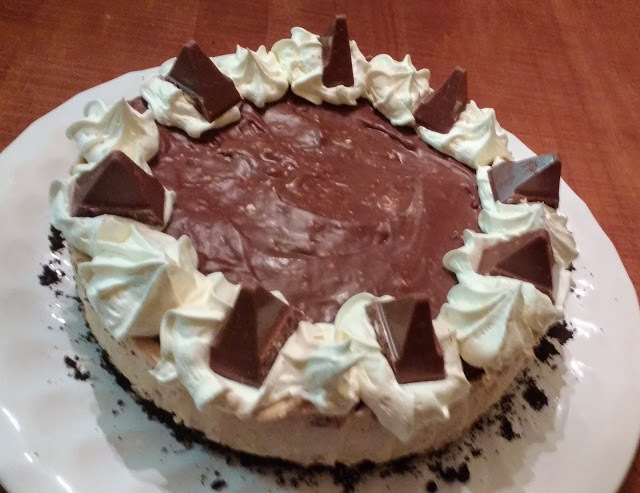 This was just one of the treats that my Mom whipped up for us kids to enjoy after school. I also made these for my girls and it was a recipe they often pulled out and made during their growing up years. They re-named them 'Mush Cookies'. In there own kitchens today their recipe cards read Mush Cookie. They are quick and easy and most often we all have the simple ingredients in our pantries. Stir in milk, sugar, and cocoa. Cook over medium heat stirring constantly until sugar is dissolved and mixture comes to a soft bowl. Continue to cook for 1 minute stirring constantly. Remove from heat. Stir in vanilla, and then stir in oatmeal all at once until no dry flakes remain. Line cookie sheets with parchment paper and using 2 teaspoons drop small mounds of cookie mixture onto pans. Place pans in refrigerator to set the cookies. Remove and store in a sealed container in the refrigerator. that the Lord is good. Combine flour, sugar, baking powder and cut the butter in with a pastry blender until it the butter is like oatmeal in the mix. Combine milk, egg and vanilla and stir into flour mixture until just combined. Top with finely diced fresh or frozen fruit of your choice . We prefer a tart fruit like rhubarb or halved Italian Plums but you can use other fruits as well. You should use enough diced fruit to cover the batter in a single layer or enough plums to use a half plum per slice of platz. Combine the flour sugar and butter to make crumbs and sprinkle over the fruit. Bake in the top 1/3 of your oven until golden brown, about 30 minutes. 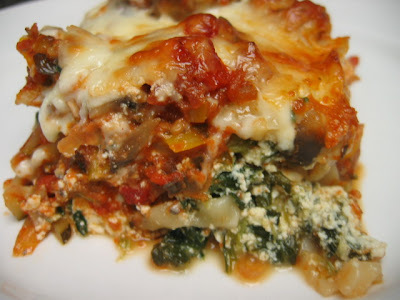 This recipe is adapted from "Eat Shrink & Be Merry" a cookbook by Janet and Greta Podleski. I have the cookbook and have enjoyed many of their recipes. 1 jar of tomato pasta sauce. . 22 ounce or 700 ml. 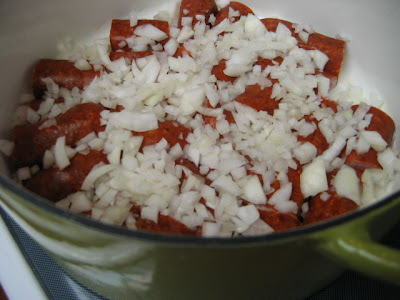 Put the sundried tomatoes in a bowl and pour 1 cup of boiling water on top. Let it stand while you make the sauce. In a large heavy pot, either spray with pam or put a tablespoon of olive oil in the pot. Saute the onions and garlic a few minutes add the recest of the veggies and seasoning and simmer about 10 minutes. Add the Pasta sauce undrained tomatoes, basil, balsamic vinegar and the sundried tomatoes with the soaking water. Let it simmer about 20 minutes on low. Combine ricotta, feta, spinach and egg and set aside. In the pan .. layer 1 1/2 cups of the sauce, 4 lasagna noodles, 1/3 of remaining sauce, 1/2 of the ricotta and spinach filling. Repeat the layer and finish with the remaining noodles. Cover with foil and put it in the oven for half an hour. Remove the foil and add mozzarella cheese and bake for an additional 20 minutes or so until it is nicely browned. Let sit a few minutes before slicing and serving. 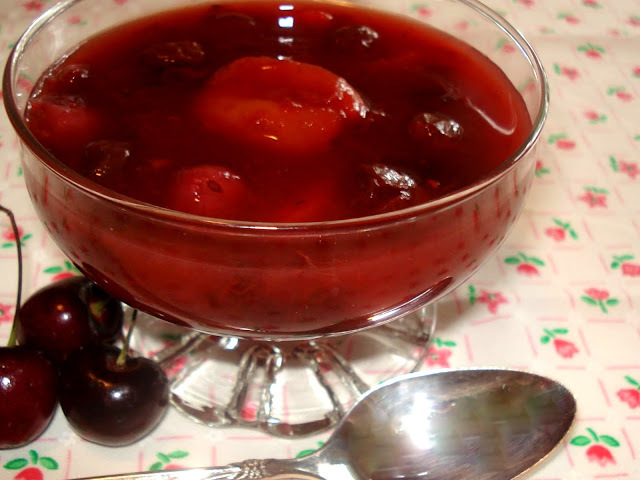 My fruit soup is very similar to Charlotte's Obst Mooss but I tend to cook it longer, until the fruit is quite soft. Oh, and I might add that I chop up the fruit before cooking, because it really expands while cooking. Cream of Wheat Pudding is a good source of calcium and iron and tastes good warm or cold. We love to scoop it into our fruit soup for dessert. Stir and cook until thick, about 4 - 5 minutes. Meanwhile, in separate bowl mix eggs, 2 tablespoons sugar and vanilla well, then stir into cooked pudding in the last minute of cooking. Pour into serving dish and allow to cool, to thicken. You can serve this warm or cold, simply scoop into the soup. It is also good with freshly squeezed orange juice if you like cream of wheat for breakfast. Combine chocolate crumbs and melted butter. Press onto bottom of a 9 inch (23 cm) spring form pan. Chill. Beat cream cheese, peanut butter, and sugar on medium speed of electric mixer until very smooth. Stir in chocolate one bar of the chocolate chopped into bite size pieces. Spoon into spring form pan. Chill 8 hours. Bring cream to a simmer over low heat; remove. Add chopped chocolate and stir until melted and smooth. Cool. I actually do this step over a double boiler. Pour over cake and place in refrigerator, OR pour over each slice as it is served. A variety of soups was a staple in Mennonite homes. During the famine years or to feed a very large family, soup could be stretched to go far. Often meat would be scarce, so the base was simply water, with added potatoes and if you were lucky you had an onion. 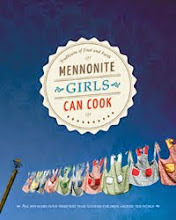 I found the following information useful to make soup from the book Mennonite Food and Folkways by Norma Jost Voth. I had the privilege of visiting Ukraine with my aunt visiting my families homestead back in 2001. Never did I ever dream that one day I would see where my parents were born. The Sauerkraut Borscht wasn't something I had ever had before and really enjoyed. I brought the recipe back with me. Add potato, sauerkraut, onion , gingerroot and bay leaf. Cook til potato and onion are tender. Add tomatoes, sugar, parsley and dill. Boil briefly. Remove from heat and add a little crean for extra richness, if desired. LOAT GOUT SCHMACKJE. (let it taste good). Disclaimer! This is NOT Mennonite but if you add farmer sausage you can pretend! Veggie chowder is a delicious and fairly healthy soup. I discovered the recipe on http://www.allrecipes.com/. 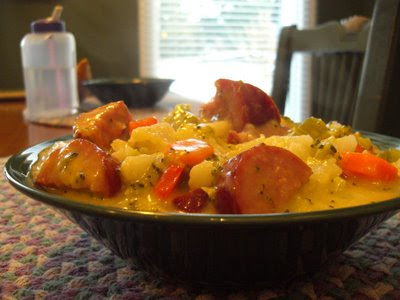 It's meatless so I add some Mennonite farmer sausage or Dutch rookworst to add some 'meat' for the man of the house. In this recipe, a variety of fresh vegetables are cooked in chicken broth and combined with a creamy cheddar cheese mixture which is seasoned with chopped parsley and ground black pepper. 1. In a Dutch oven or soup kettle, saute the pepper and onions in butter or margarine until tender. 2. Add remaining vegetables, water, bouillon, salt, and pepper; bring to a boil. Reduce heat; simmer covered for 20 minutes, or until the vegetables are tender. 3. Combine flour and milk until smooth; stir into pan. Bring soup to a boil; cook and stir for 2 minutes. Mix in the parsley. Just before serving, stir in the cheese until melted. I have my doubts if anyone will actually try this recipe but I wanted to post it for documentation sake. This recipe originated with Terry's Grandma. He loved it . . .talked about it. . .asked her to make it for me. . .and she did. . .once. Shortly after that ... .I made it .. . once. . .20 years ago. I know of no one else in the extended family that makes it and even when asking my mother in law to recall all the ingredients we had a hard time remembering exactly how it was. I decided to tackle it yesterday and really .. . it was quite a fun challenge. After dinner. . . he walked over to our new coffee table book for our grand babies. . and pressed the little pig. . .the little pig immediately oinked. . He loved it. . .I quite enjoyed it. . . and will likely try it again. It starts out simply. . .making some homemade noodles. 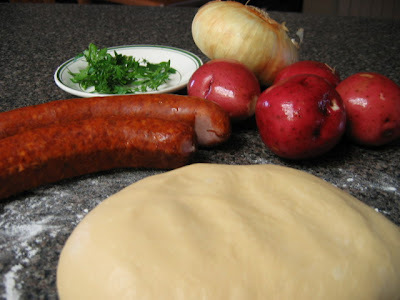 Mix all the ingredients to make a hard dough. It will be easier if you let it rest in between covered with plastic wrap. I left it for 10 minutes at a time. When the dough is smooth. . cover it up for a good half hour. 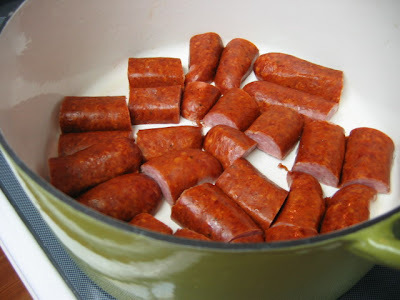 smoked farmer sausage. . or other Ukrainian style sausage. 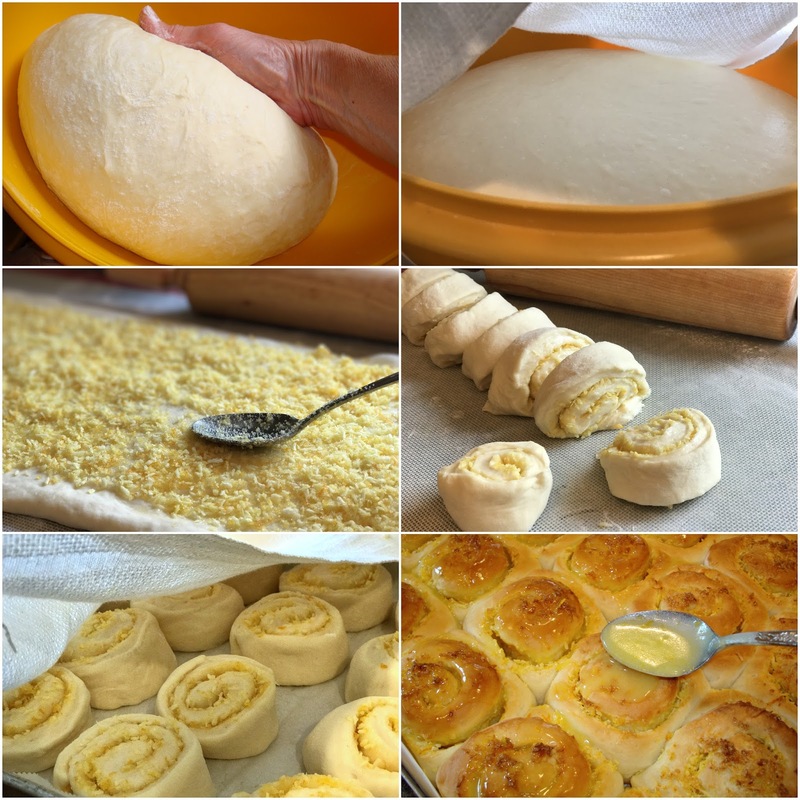 Roll the dough out very thin. You should be able to barely see the counter underneath. At this point. . you could simply make noodles by flouring the top of the dough a bit.. .
cutting 2 inch wide strips and layering them and cutting through all the layers to make 1/4 inch wide noodles. . and simply cook them.
. .. but not me. . .oh no. . I brushed some bacon drippings over the dough and rolled it up. . jelly roll style. I put the farmer sausage in the pot. I then chopped up the onion and puit that on top. 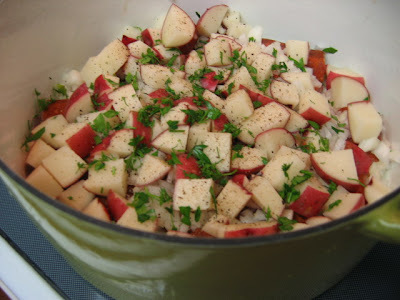 . . .diced the potatoes and layered that over the onions. and then the parsley over that. . I added to the pot. . enough water to come half way up the sausage. I covered the pot and brought the sausage, potatoes and onions to a boil. Turn down the heat and simmer with the lid on about 15 minutes. After I rolled up the noodle dough .. I cut it into 1 inch pieces. . .
next time I would cut it narrower .. perhaps 1/2 inch pieces. After the potatoes had cooked for about 15 minutes.. . I lifted the lid and put the noodles on top. Close the lid quickly. . .you don't want to lose the steam. Continue to have on a medium low heat for about 20 minutes or until the water has cooked out. You should start to hear the sausage sizzle. . The noodles will be firm but well cooked. I made a cream sauce of 1/4 cup butter and 1 cup of heavy cream. . simmered until slightly thickened. I also sauteed some onions. . and of course steamed green beans for .. color and health. If anyone. . attempts this . 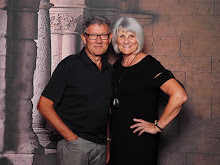 . . please leave a comment and let me know how it worked out for you .. I have done my family duty. . The recipe is now recorded for future generations. .
No longer will I hear. . .
"no one wrote it down?"